For the coin series minted by China, see Chinese lunar coins. The reverse design consists of a galloping Horse set against the background of the pre-historic Uffington White Horse located in Oxfordshire. Lettering on the coin reads "YEAR OF THE HORSE · 2014"a plus details of the mass and metal content of the coin. The Chinese character for Horse (馬) is displayed near the coin's centre. 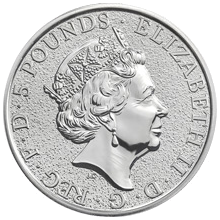 In March 2014 it was reported that a number of 1oz bullion coins had mistakenly been struck with the incorrect die. 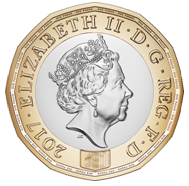 Around 38,000 of the Lunar Horse coins were struck with an obverse intended for the Britannia series while 17,000 Britannia coin were stuck with the obverse for the Lunar series. The reverse design consists of a two Yorkshire Swaledale sheep facing each other and the background consists of a forest of tree.B As designer Wuon-Gean Ho explains "the ancient Chinese character for the word sheep looks a little bit like a tree" so the forest consists of a series of this character (羊). This character is further displayed near the coin's center. Across the top lettering reads "YEAR OF THE SHEEP · 2015" plus details of the mass and metal content of the coin. The reverse design features a leaping Rhesus monkey jumping forward from a tree with another monkey also jumping in the background. Lettering on the coin reads "YEAR OF THE MONKEY· 2016"A plus details of the mass and metal content of the coin. The Chinese character for Monkey (猴) is displayed in the lower right of the coin. The reverse design features a crowing rooster amongst ten sea thrift flowers, the number ten symbolising of perfection in Chinese culture. Lettering on the coin reads "YEAR OF THE ROOSTER · 2017"A plus details of the mass and metal content of the coin. The Chinese character for Rooster (雞) is displayed near the coin's centre. 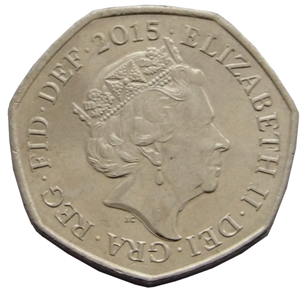 Unlike the previous coins in the series the 2017 coin breaks the otherwise uniform smooth obverse design, opting for an obverse similar to that of the Britannia coin series. The reverse design features a leaping dog with the Chinese character (狗) displayed near the coin's center. ^ Ho, Wuon-Gean. 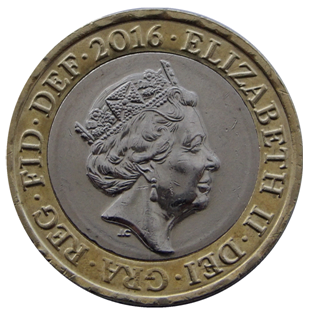 "Lunar Coin Commission for The Royal Mint". wuongean.com. Retrieved 28 September 2016. ^ "2014 Royal Mint Year of the Horse Silver Bullion Coin". 24carat.co.uk. Retrieved 29 September 2016. 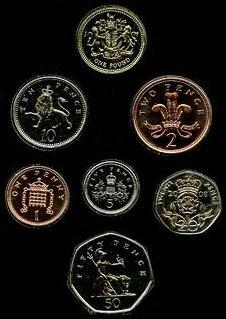 ^ The 2015 Lunar Year of the Sheep UK Coins from The Royal Mint. YouTube. 2014. Retrieved 28 September 2016. ^ The 2015 Lunar Year of the Sheep UK Coins from The Royal Mint. YouTube. 2014. Retrieved 29 September 2016. ^ "Lunar Year of the Rooster 2017 UK Five Ounce Gold Proof Coin". Royal Mint. Royal Mint. Retrieved 29 September 2016. ^ "The Royal Mint 2017 Lunar Year of the Rooster Coins". chards.co.uk. Retrieved 22 October 2016. ^ a b c "Royal Mints bullion Lunar Rooster range out along with revised Britannia". AgAuNews. Retrieved 12 May 2017. ^ "2016 UK Lunar Year of the Monkey Silver Bullion Coin". Chard. Retrieved 12 May 2017. ^ a b Starck, Jeff. "Royal Mint launches fourth annual round of coins in Lunar bullion program". Coin World. Retrieved 12 May 2017. ^ a b "The Lunar Year of the Dog 2018". Royal Mint. Retrieved 17 September 2017. ^ a b "The Year of the Pig By the Royal Mint". Bullion Exchange. Retrieved 14 September 2018. ^ "2016 Royal Mint One Ounce Year of the Monkey Coin". Tax Free Gold. Retrieved 12 May 2017. In numismatics, a mule is a coin or medal minted with obverse and reverse designs not normally seen on the same piece. These can be intentional or produced by error. This type of error is highly sought after, and examples can fetch high prices from collectors.